Not everyone is as eager about nails as I am. The thought of doing your nails every day may be absolutely terrifying and frankly, unimaginable. If you're that kind of person, you've probably tried gel polish or shellac. This type of mani lasts upwards of two weeks on your nails, and keeps them happily hardened while its on. The problem with them is that they can be very pricey. Even though you only have to go every two weeks, you still have to fork over a wad of cash you may not have. Luckily, there's at least one product available that I can personally vouche for as an alternative to pricey salon gels! 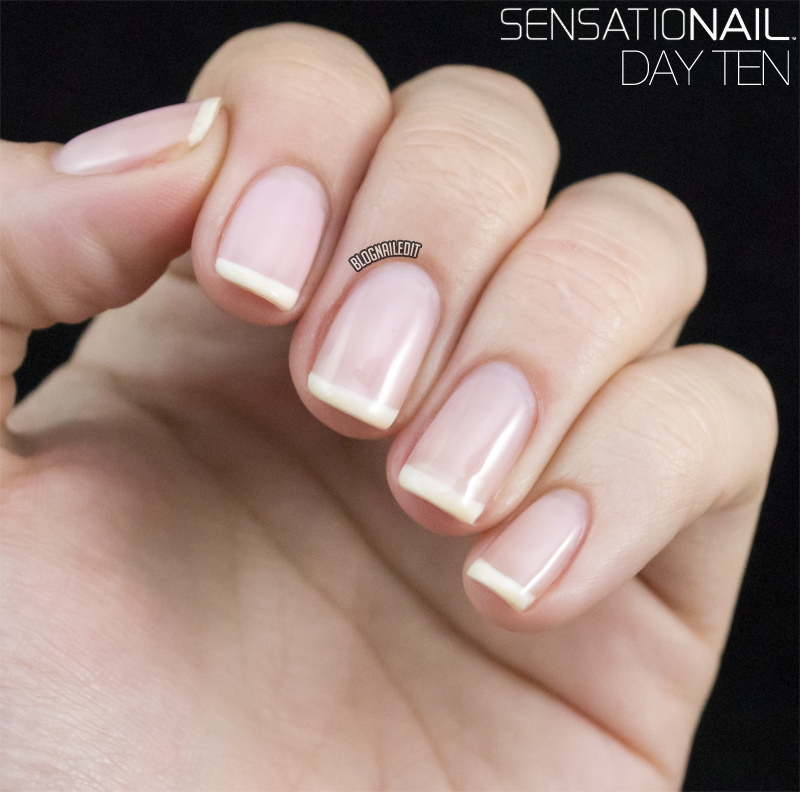 Today, I'm reviewing an at-home gel system from SensatioNAIL. I was provided with the Pink Chiffon Starter Kit ($59.99) and an additional color of my choosing. I chose White Lily ($11.99), with the intention of creating a French Manicure to test with. I've listed the prices already so you won't encounter any sticker shock. Gel polishes are always more expensive than their lacquer counterparts, usually about 50% more. So don't be alarmed at $11.99 per color...it's actually a great price! The Starter Kit comes with literally everything you need to get started and complete the manicure properly, including an LED lamp! Their LED lamp is the cutest, most portable lamp I've used. It still requires an outlet, but beyond that, it's amazing. The longest cure time for an individual layer is 60 seconds, at which point the light shuts off automatically. For other layers, you only need 30 seconds, and for those times, there's also a little beeping indicator that you hear after 30 seconds. The instructions are also incredibly clear, and if followed properly, will lead you to amazing results. After following the instructions and applying the look, I chose to test this over my break in Southern California. I was plenty busy with cooking, days at the beach, wrapping and ripping open presents, so my hands took about an average beating. The pictures below are ten days apart. As you can see, the polish held up beautifully. There was absolutely no chipping, just outgrowth as my nails grew over the ten days. The gels also helped protect my nails. I don't think I could consistently grow my nails for ten days without breakage if it didn't have some sort of protection, and SensatioNAIL did a wonderful job of that. There's some discoloration on the tips, but it's not noticeable in person. In fact, I didn't notice it until I added the pictures to this post. So for me, this is a wonderful deal. Additionally, I've seen SensatioNAIL pop up on Groupon once or twice before, so keep an eye on your inboxes for those deals to come by. What's even more appealing is the availability of the product in the US. You can shop in the SensatioNAIL online store, as well as popular pharmacy stores including CVS, Walmart, Target, Walgreens, and Drugstore.com. I definitely recommend this brand if you're looking to get gel manis at home! These products were sent to me by SensatioNAIL. The reviews are based entirely on my experience with the products and were in no way influenced by anyone. I'm impressed! 10 days and it looks fantastic! Sounds like a great solution for someone who's ultra busy or planning a trip. wow, have to try this!!! The first time I used a gel polish, I completely ruined one of my pinky nails. The reason that's happening to you is that you're scraping your nail plate too roughly to remove the gel. If it's not coming off easily after soaking in the acetone, keep soaking it. Rewet your cotton pads if you need to, and I recommend keeping your hands warm. Either place them under a blanket, a heating pad, or if you can take it, in front of a heater. The warmth will help to soften the gels as they soak in the acetone and foil. If it doesn't slide off easily, just be patient and keep soaking. If you grow impatient and resort to scraping, your nail plate will scrape right off with the polish. Unfortunately, you'll have to wait for the damage to grow out, but I trust OPI Nail Envy to rebuild my damaged nail plates. Grab a bottle of that, and use it as your base coat (with regular polish) and on your nails if they're ever naked. I'm sorry that happened, but at least you know it's not because of the polish! Awesome! I like to use gelous and do "fake" gel nails when I am gone for conferences. I should look into this method to keep my nails looking great for the whole week I am away. I was wondering if the lamp would effect the use of rhinestones, caviar beads, etc. Do they get dull at all? That's a great question, and unfortunately, one I don't have an answer to. I don't think an LED light (or UV for that matter) would affect the shine of rhinestones. The top coat dries shiny, not cloudy or matte, so I don't think that would affect it either. I haven't tested it though, so unfortunately I can't give you a definitive answer. I just purchased the new french kit Sensationail has with the white tips as well as their new gel strengthener which replaces the base coat layer and adds a bit more thickness. Your great review convinced me it was a worthwhile purchase! After a few days they still look great, with my dry brittle nails I'm usually fully chipped by now. My question for you...are you aware of other brands (short of Sally Hansen) intended for UV lamps that will also cure with the LED lamp? I'm glad they're working for you! You can cure LED polishes with UV light, however, the other way is not true. Check the manufacturer's website. They should indicate what strength light unit you need, and whether it's UV or LED curable. Are you supposed to use cuticle oil daily? I would recommend it before you go to bed. You're laying there for 6, 8, 10 hours, so you might as well be doing some moisturizing.